What If Everything You Thought You Knew About Professional Success Was Wrong? There’s a worldwide agenda to do just the opposite. Keeping it real is intuition, faith, trust and letting go. Keeping it real is understanding what success means on your own terms and having the courage to run after that. Keeping it real doesn’t mean flaky, lightweight, vague or unmeasurable. And it certainly doesn’t mean dreaming at the expense of doing. Keeping it real is getting things done informed by your biggest dreams, aspirations, goals and creative urges. Business titans like Sir Richard Branson and Jeff Bezos keep it real. Zen monks too. A person who keeps it real gets things done, but does it in a way that doesn’t come at the expense of what they truly cherish and value. Keeping it real isn’t something you accomplish. It isn’t a destination you arrive at, it’s the journey itself. It’s a practice, an art. Keeping it real is the art of listening to the quiet, clear voice emanating from your soul and answering “Yes”. Go ahead and listen. You’ll hear it. The voice reminding you what makes YOU feel authentic, happy and free. The voice reminding you of the unique value that YOU alone can bring to this world. Now, how will you answer that voice? How will you start to pay attention to the way you turn up for that journey and how you keep yourself well, alive and thriving on the road? Not just in any superficial sense of that sentiment. But in a way that sets you up perfectly in mind, body and spirit? 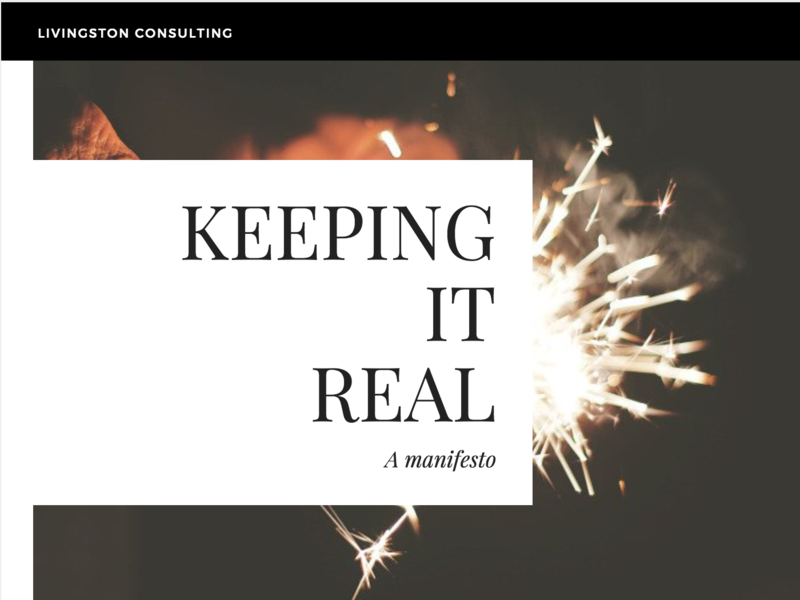 Coming soon, I’m going to be sharing my Keeping It Real Manifesto. Regard it as the set of words that are going to shake you out of whatever current complacency you’re in and into a new conscious awareness of how you turn up for work and indeed live your life. To make sure you get first sight of it, make sure to sign up here.